Discussion: Michael and Summer were left all alone this week, as Brian was overtaken by zombie flu, and Stackpole was off in the wilds of New Hampshire. They chat about the rumored tablet sized iTouch from Apple that may be coming out soon, and how it could be perfectly poised to change the game that Kindle and Plastic Logic have only just begun. 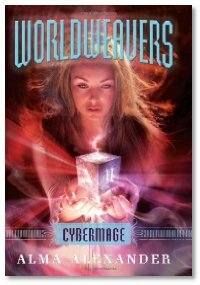 Interview: Alma Alexander joins us this week to talk about her YA series "Worldweavers", and the third book in the trilogy, Cybermage. The series is set in the Pacific Northwest, and makes good use of the mystical environment and the Native American influences found there, and has a strong young female protagonist, Thea Winthrop. From the Trickster, to Grandmother Spider, to incorporating a magical twist on Nikola Tesla and the Internet, the tales of the students at the Wandless Academy might be of interest to tweens and teens looking for something beyond Hogwarts.